The vast, corporate-funded campaign to weaken unions and lower wages reached statehouses in Maine, Minnesota, Montana and Missouri this week. 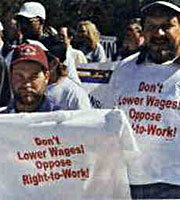 In Maine, Rep. Tom Winsor of Norway requested that right-to-work (for LESS) bills be drafted (LR 491 and 492). So did Sen. Lois Snowe-Mello of Poland (LR 608). Right-to-work (for LESS) bills were also proposed in Minnesota, Montana and Missouri. A Missouri senator is proposing a statewide vote in August 2012 on whether to make Missouri a "right-to-work" state...Legislation filed Thursday by Republican Sen. Jason Crowell, of Cape Girardeau, would refer the union issue to voters next year...Earlier this session, Sen. Luann Ridgeway, of Smithville, filed a right-to-work proposal that would require the governor's signature to become law. It would not go on the ballot. Mainers and Missourians especially need to be very, very afraid, according to the IBT's political intelligence. Research shows that most people don't know what right-to-work (for LESS) laws really do. That's intentional. You can be absolutely sure that a great deal of time and corporate money was spent coming up with the misleading "right to work" name. It sounds like it prevents workers from being denied a job. That isn't what it does at all. "Right to work (for LESS)" laws let employees opt out of paying union dues. Freeloaders get union representation and are covered by the union contract. But they don't pay a dime toward the considerable cost a union incurs for providing those benefits. Right-to-work (for LESS) laws are intended to weaken workers' unions, their bargaining power -- and thus their wages and benefits. When union wages go down, workers' wages fall throughout the state. A co-ordinated network of think tanks, business groups and phony grass-roots organizations has been working energetically toward passing right-to-work (for LESS) laws for years. They don't like to be exposed for what they are. 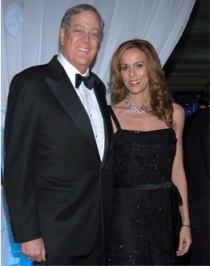 One of the biggest financial supporters of right-to-work (for LESS) campaigns is David Koch, the 49th richest man in the world. His efforts to destroy the middle class were recently exposed in The New Yorker magazine. As a result he was booed at the ballet in New York. •Fewer people have health care and the taxpayers pay substantially more to support the state's Medicaid program. •The rate of workplace deaths is 53 percent higher. •The poverty rate rises; it's 19 percent in right-to-work (for LESS) states, compared with 16.6 percent in other states. There's an old saying, "As Maine goes, so goes the nation." Let's hope Mainers lead the way in fighting like hell against these attempts to turn America into a low-wage nation.